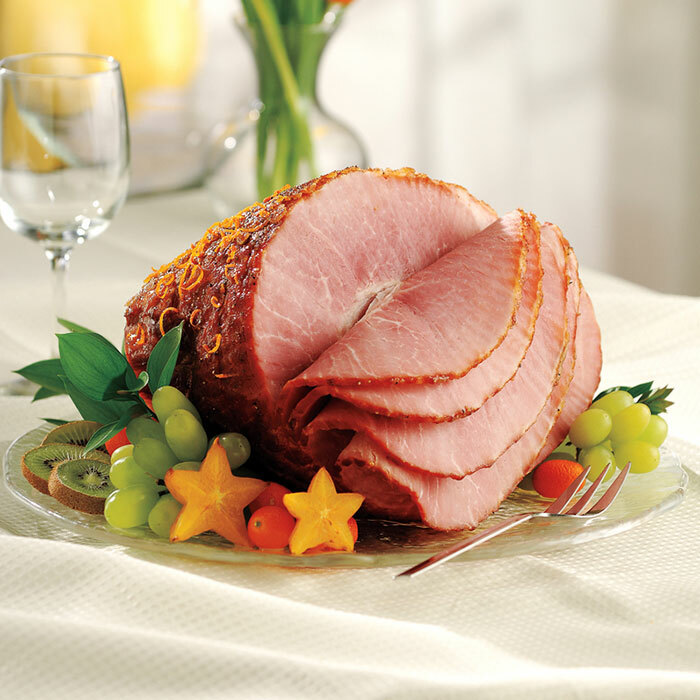 Give your holiday ham a kick! Preheat oven to 325°. Place ham, cut side down, on rack in large roasting pan. Bake ham 1 hour or until internal temperature reaches 90°. Meanwhile, in small saucepan, heat marmalade, orange juice, vinegar, Dijon mustard, 1 tablespoon orange zest, pumpkin pie spice, whole grain mustard and dry mustard to simmering over medium heat; simmer 2 minutes, stirring occasionally. Add brown sugar and simmer 2 minutes longer, stirring occasionally. Remove saucepan form heat. Remove ham from oven. Brush ham with some of the glaze and sprinkle remaining 1 tablespoon orange zest over ham; return ham to oven. Bake 45 minutes longer or until internal temperature reaches 130°, brushing ham every 15 minutes with glaze. Carefully place ham on serving platter. Cover loosely with foil and let stand 15 minutes before serving. Internal temperature will rise to 140° upon standing. Pour any drippings in roasting pan into same saucepan with any remaining glaze; heat to simmering over medium-high heat. Simmer 8 to 10 minutes or until sauce is reduced to about 2 cups. Serve ham with sauce.